Cardio kickboxing can burn between 350 and 450 calories per hour. Get Fit is a group cardio kickboxing that combines martial arts techniques with fast-paced cardio. This high-energy workout challenges the beginner and elite athlete alike. Build stamina, improve coordination and flexibility, and burn calories as you build lean muscle with this fun and challenging workout. An experienced instructor leads cardio kickboxing class by demonstrating choreographed movements of punches, kicks, and knee strikes set to fast-paced music. Cardio kickboxing combinations are a mix of punches and kicks. Classes also incorporate a warmup and cool down and both dynamic and static stretching. Often, there is a brief segment specifically for core exercises like crunches and planking. Typical cardio kickboxing classes run from 30 minutes to one hour, depending on the gym or studio. Despite the name, cardio kickboxing is a non-contact workout. All punches and kicks are thrown into the air or onto pads. It’s a high-energy workout that can burn between 350 and 450 calories an hour, according to the American Council on Exercise. Your elevated heart rate moves into in an intense zone in which cardiovascular conditioning takes place. Click Here to Start Your 2 Week Free Trial! This app will allow you to buy classes, book classes and see notifications about classes. Young Forever Fitness and Nutrition Coach is proud to offer some of the most fun and effective workout classes in Broomall. Whether you’re looking to lose weight, gain muscle, or build confidence, we can help you achieve your fitness goals. 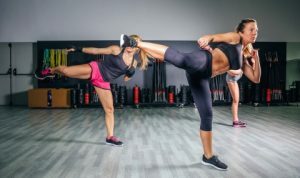 In addition to our cardio kickboxing class that combines martial arts techniques with fast-paced cardio, we also offer an invigorating bootcamp-style class called Sweat30 that will get your heart pumping in just 30 minutes. To learn more about our fitness center, read more about our philosophy or check out some success stories from some of our gym members. Get your free consultation today!